Posted in: General Market Thoughts. Tagged: $NYSI, $SPX, Cumulative Volume Index, Fibonacci. Normally, this is the time of year when you can get long the market and just hold on until the March/April period when going to cash makes sense. I’m thinking this year will be different due to the negative divergences in the Summation Index and the Cumulative Volume Index. I wouldn’t mind being proven wrong about this. The bounce that the 5,3,3 Sto predicted appears to have finally started but could take a back seat tomorrow with the Jobs Report. If those numbers are decent, then the rally should continue. I posted on the 26th that the important area is going to be the 1440 area, and the Fib retrace # at 1447. Let’s see what happens once we reach those levels, if we indeed do. Nothing much else to add to the post from October 26th. Posted in: General Market Thoughts. Tagged: $NDX, $SPX, Aroon Oscillator, Fibonacci, QQQ. 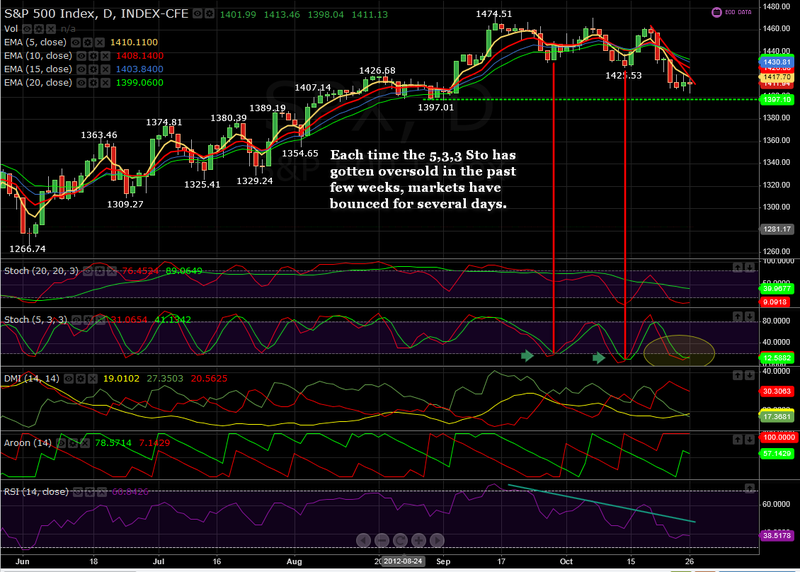 Each time the 5,3,3, Sto drops into oversold territory, you have to expect a bounce to follow. This setup has happened two previous times since the mid-September high and it has just happened again. The last two times, marked on the chart with a red vertical line, the markets ran all the way up to the previous high level in the 1465 area. I don’t think this bounce is going to take us that high, again, but I’ll let the market decide where it wants to go. Right now I think a bounce to 1440 or so will be about all we’re going to get, but that’s just my opinion. If the market wants to go higher then we should see a huge push to and then above the 1465 area and done on good volume. I don’t see it happening, but then I’ve already just about convinced myself that we’ve topped out for the year. Yeah, but then what do I know? 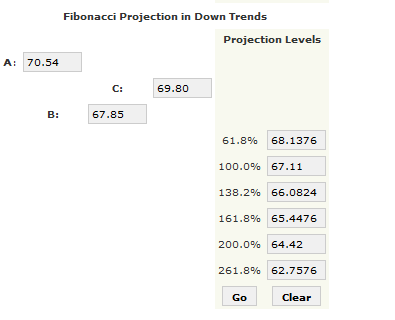 Q’s came within about 60cents of their 261% Fibonacci projection target on Friday. That final target is 62.75 and the fact that the Q’s spiked down to 63.35 at the open on Friday may be enough to have completed these projections. After all, this is voodoo not science. Per the 5,3,3 Sto, the Q’s are just as oversold as is $SPX so it makes sense that they should bounce out of current levels. That candle on the Q’s daily chart is a Hammer which is a reversal candle. The upper wick is a little longer than it ought to be but I’m going with Hammer until proven otherwise. Bottom line, Q’s came within a hare’s breath of completing their final Fib downward projection and are oversold so one just has to be looking for some kind of retrace from here, IMHO, of course. Daily chart of $SPX showing 5,3,3 Sto with a kinda’ bullish cross today. Also note how the -DI line has peaked and is pointing down. Would have liked to have seen the RSI 14 drop below 30 to indicate a better chance at a real bottom, but you don’t always get what you want. And don’t forget that we haven’t had a capitulation climax selling event yet, so that’s something to look forward to on down the line. This chart of $NDX shows something that doesn’t happen very often and that is that the Aroon Oscillator has dropped to -100. 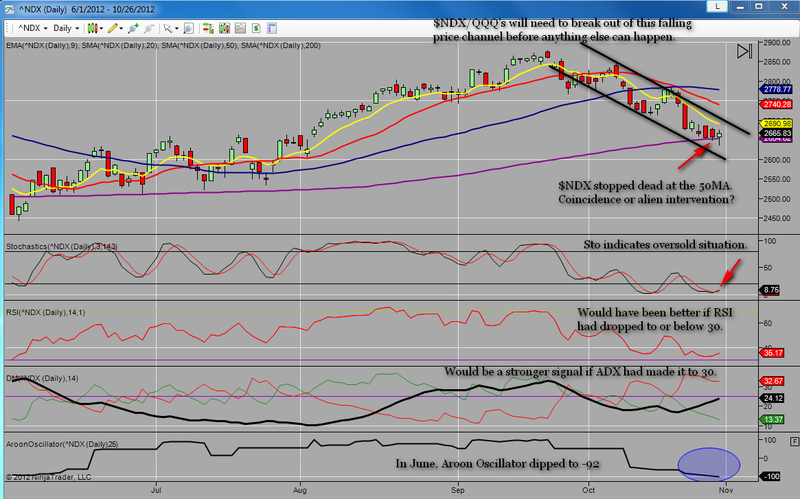 This also shows -100 on the Q’s but I just happened to be looking at the $NDX when I noticed this. As noted on the chart, back in June the AO only dropped to -92 but the RSI did drop to 30 and the ADX rose to 32 so the RSI and the ADX were prime for some kind of bounce at the time. Right now the signal isn’t as clear but it may be good enough. Things should be much clearer by the close of trading on Tuesday. Click the chart to open it in a new window. Posted in: General Market Thoughts. Tagged: Fibonacci, QQQ. On the Q’s we put in a lower low today so we now have a lower high, $69.80 from the 5th, and today’s lower low, $67.10. This is now a confirmed A,B,C down formation with the A point being the swing high of $70.54 from September 21st, the B point being $67.85 from September 26th, and the C point being $69.80 from October 5th. This is all theoretical at this point, however it does seem that’s there’s more downside ahead for the Q’s. Interesting how the Q’s s stopped today just one penny below the 100% projection level. This could mean a bounce for tomorrow, though I’m not counting on it, and since we’ve gone to that 100% projection level then there’s a good chance the Q’s are headed to at least the 138% projection level at 66.08. On the chart below, note how the Q’s pierced the lower support line and then closed just above it. Also note how the Q’s moved back inside what I once considered a Bull Flag pattern but now, with today’s lower low, consider a new falling price channel. And if the Q’s do move to the 138% projection level of 66.08 they will have broken the rising trend line from the June lows. Bottom line for now, I wouldn’t be trying to catch any falling knives here as I do believe that there will be a better buying op a little further down the road, IMHO, of course.